- a brand new installer! 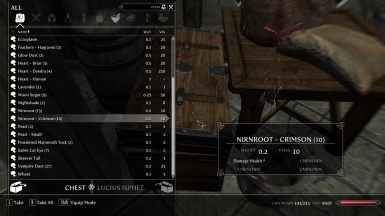 and thus provides a less tedious experience when managing your inventory. A fellow modder has been kind enough to update ASM. You might want to try it out and give Mebantiza some feedback.
! 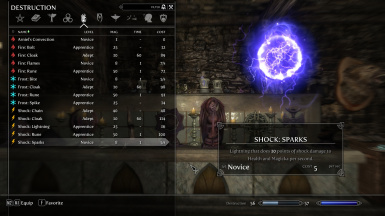 Spells - I went for a more vanilla feel when doing these and I'm pretty happy with the results. 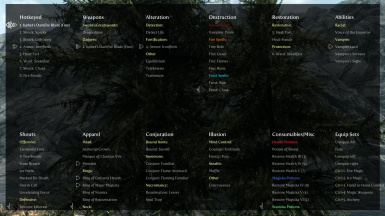 For example Destruction Spells are sorted by damage type - Fire: Bolt, Frost: Lance, etc.
! 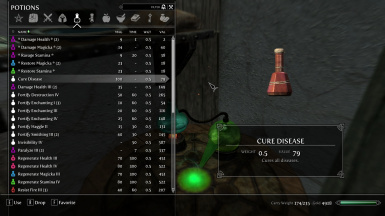 Categorization - ASM also attempts to re-categorize some items f.e. some notes are no longer categorized as books, skulls categorized as clutter etc.
! 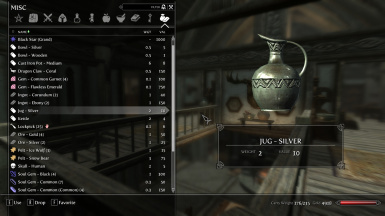 Realistic weight - Re-balances inconsistent weight with some items f.e. small fish are no longer as heavy as big potions. It's OPTIONAL of course.
! 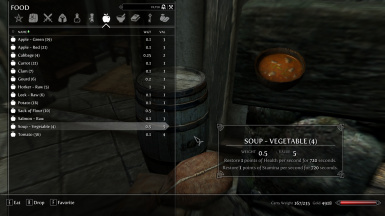 Weight reduction - Reduces the weight for Crafting, Food, Ingredients, Potions and Scrolls. It's OPTIONAL of course. since those are very close to vanilla. 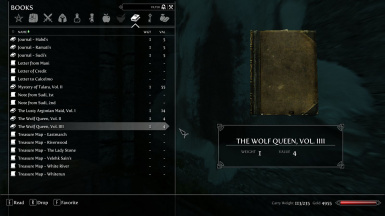 So the Spell Tome: Fireball gives you the Fire: Ball spell etc. 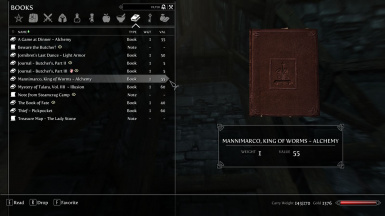 - To achieve better sorting results with Books, Roman numerals IV, IX and L use their alternatives IIII, VIIII and XXXXX (only used once fortunately) - does not apply to Potions. It might seem funny, but it's totally legit. If it bothers you pretend that Tamriel's written language uses unevolved Roman numerals. 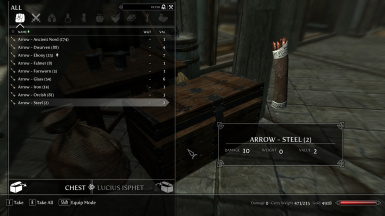 Remember the LOAD ORDER is important when installing mods. 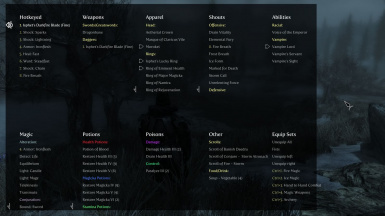 To put it simple: a mod loaded on TOP of the load order will be overwritten by all the mods below and a mod loaded on the BOTTOM of the list will overwrite all the mods above - IF there is something to overwrite. I cannot tell you where to load ASM precisely, so don't be afraid to experiment a bit. 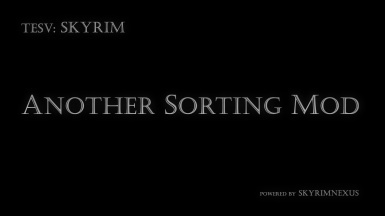 As any other sorting mod, ASM will "conflict" with most overhaul mods that deal with potions, crafting materials, spells, books and so on. Nothing can be done about this, except to choose a load order which would favor either sorting or overhaul. 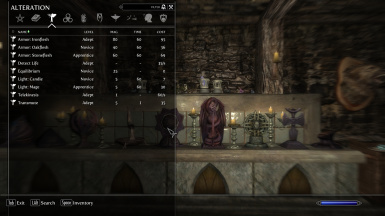 I'll provide compatibility patches for mods I consider essential or use myself though. If you don't know what to do with your load order just use BOSS. As far as I know it handles ASM perfectly fine. 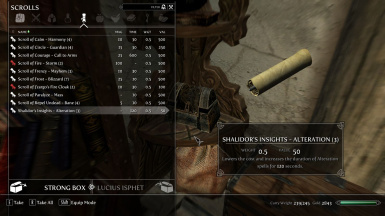 I would like to thank Headbomb and Valdacil for creating some of the most essential Skyrim mods out there (of course I mean their sorting mods). I would also like to thank favmenumodder and Onigamibr. The first one for making the brilliant CFM and the latter one for tweaking it to near perfection. Thank you guys/gals. Another thanks goes to televator for making the Better Quest and Skill Book Names Compatibility patch. Lastly I'd like to thank Ka3m0n for featuring ASM on GEMS.